This is a very simple baked chicken dish to cook. The main ingredients are chicken and pineapple chunks and no need to add other vegetables. But you can try to experiment on which kind of vegetables you can use. By the way, this recipe uses MSG or granulated as one of the seasonings but you can always omit or substitute it with patis (fish sauce) . 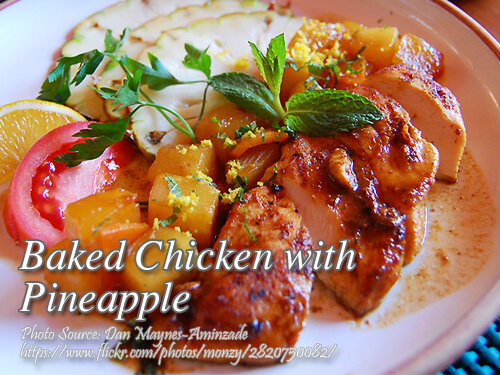 To cook baked chicken with pineapple; Cut chicken into small pieces. Marinate in soy sauce, salt, sugar and MSG. Let stand for 1/2 hour. Place in baking pan, pour in pineapple chunks and 1/2 cup of its juice. Baked in oven with 350 °F heat for 45 minutes or until done. You may also steam-bake it in ordinary pan with a tight cover. Garnish with spring onions or parsley. Cut chicken into small pieces. Marinate in soy sauce, salt, sugar and MSG. Let stand for ½ hour. Place in baking pan, pour in pineapple chunks and ½ cup of its juice. Baked in oven with 350 °F heat for 45 minutes or until done. You may also steam-bake it in ordinary pan with a tight cover. Garnish with spring onions or parsley.